A good knowledge of the habits of fish, and the tell-tale signs that betray their presence, can mean the difference between success and failure when fishing lakes in summer. Perhaps the most beautiful sight to an angler’s eye is a peaceful summer lake with the sun high above the water, enriching the colours of the surrounding herbage. Such a setting is always full of promise, but the keen angler will want to know much more – a beautiful environment does not mean that fish will be caught.No two lakes are the same. Not only do the depth, extent and clarity vary from lake to lake, but so do plant life, food and fish.Reading the waterShallow lakes are the easiest to read, and often abound in food and large fish. Almost every square inch of the bottom of a silty, shallow lake will be rich in bloodworms (the larvae of the midge), on which nearly every species, except pike, feeds. 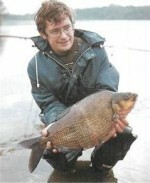 Both tench and carp are avid silt-sifters and consume larvae in vast quantities, as”, to a lesser extent, do rudd and roach. Large patches of big bubbles, seen anywhere in the lake, indicate a feeding carp, while smaller effervescent bubbles betray tench.Try to match any bubbles with the species suspected. Although most species can be recognised by the bubbles they send up while feeding, one fish often makes this guessing game much harder – the eel, which can create about every kind of bubble. Usually, though, a very large patch of frothy bubbles, which does not move or reappear, gives away an eel as it twists and burrows into the silt to feed on bloodworms or merely to hole up and rest after a good meal.What to look forEven during a hot summer’s day, fish activity can be seen somewhere on small lakes, especially in marginal plant life, such as lilies, reeds, or patches of broad-leaved pota-mogeton. Look for lily stalks ‘knocking’ as a large carp or tench moves lazily beneath, sucking in water snail, or their eggs, which adhere to the underside of the pads.In other lakes, particularly very weedy waters, feeding can be seen almost any time of the day. To read any new water you need to spend as much free time there as possible, just looking. Close and consistent observation will tell you what fish are present, on what they feed, and, most important, when and where.Sudden splashing from a rudd as it leaps clear of the water may indicate a hunting pike. Pike anglers should also note any undercut banks where predators might hole up. A fallen tree or a mass of tangled roots pushing out into the water create a natural lie. And pike will pounce from the edge of reedmace and rushbeds whose stalks are cover enough to hide them from their prey. 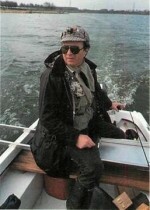 On a larger lake, pike anglers need to carry out a methodical mapping of the bed by plumbing its contours. Pike lie in fall-offs and indentations, and launch ambushes from behind underwater obstructions often invisible from the bank.If bream are thought to be present, watch carefully for movements as the shoal meanders slowly beneath lilies or potamogeton. Stalks which move when there is no wind, or small ripples from the pads, are the pointers to look for, as is the occasional stream of bubbles as a bream dives into the bottom layer of silt or silkweed to feed. 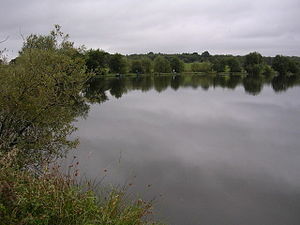 If surface weed is sparse, search for disturbed water where the colour is darker than elsewhere, or where small patches of bubbles rise to the surface when the rest of the lake has none.Observation with binoculars of where the shoals gather for their evening or morning feed may provide a basis for your fishing, as bream take advantage of the poor light to enter shallower marginal waters in search of food. On some lakes the reverse may happen, with bream feeding during daylight betraying their presence by gently moving the marginal reeds. A bait on the edge of the margins will often take them.Feeding patternsWorking out feeding patterns in huge lakes is not easy. In any case, they do not necessarily apply to similar water, even an adjacent lake.On many lakes feeding patterns are evident only during low light, as at dawn and dusk, or when the sky is heavily overcast before a storm. But if prolonged heavy rain chills the water, you may not see the slightest sign of fish. So try to explore new waters during periods of settled weather, preferably when the sun is well up.Beware of splashy rises during fully sun up for they are usually made by small fish rather than specimens. Big fish make surprisingly little movement when swimming through surface weed because unless they are preoccupied in their feeding on bottom buried baits, such as bloodworms, they need only move casually to sip in a variety of creatures. Water snails, water boatmen, damselfly nymphs, water lice, freshwater shrimps, caddis grubs and slow movers like pea mussels and even swan mussels are taken like this.As the sun goes down, you may notice rudd and roach ‘priming’ on the surface stimulated by the evening hatch of midges and other aquatic flies. Surface species feed heavily on pupae or nymphs, and during a prolific hatch, when millions of nymphs shed their cases to become airborne flies, activity can be seen all over the lake. It is thought that only carp have pharyngeal teeth powerful enough to crush a small swan mussel for the succulent meat it contains, but tench and bream will take a mussel bait, and roach and rudd have been known to take them whole, de-shelled. Perhaps fish have a method for opening their clam-like shells. 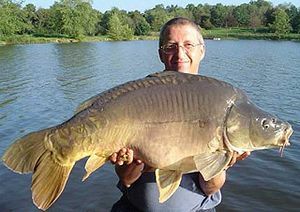 In lakes where swan mussels grow large, one usually finds that the bigger fish, like carp and tench, reach specimen proportions. Is it coincidence? The smallest form of life relevant to fishing summer lakes, which moves around with the warm surface-layers directed by the wind, is daphnia, or water fleas. During warm conditions these crustaceans can multiply very quickly to form vast clouds of protein-packed food, varying in colour from grey to a shade of brick dust. All surface species feed heavily on daphnia, but so do tench and carp in very shallow waters. In lakes thickly clouded with daphnia, tench in particular can become so preoc-cupied with feeding that they totally ignore other food, including baits. In windy conditions, daphnia are more responsible for movement of the smaller species than any other food, and the old advice to fish into the wind is well founded. Wind direction is also important when nymphs are hatching, because they will drift in their thousands, with the surface scum, to the windward shore. With large or huge lakes, much of this water-craft still applies, except that fish locations and movements are much harder to discover. Bream, especially, are known to roam over the entire water within 24 hours, resting and feeding. Baits are only a small part of the angler’s involvement with summer lakes until all the homework has been done. It is useless offering a good bait to fish which are not present in the swim, so all elements must be considered – wind direction, weed growth (bottom and surface), water clarity, and the species to be found. In lakes that seem barren of surface weed, marginal weed growths are always frequented by some species. Carp and tench, especially, love to patrol along sedges or reed mace for damselfly larvae, snails and caddis, which live in the reed stems. At first glance, even with crystal clear water, there does not appear to be much food to sustain large fish, but all species, except predators, consume vast quantities of tiny food items. Only baits such as large protein ‘specials’, breadflakes, and others, give the fish a quantity of food in a single mouthful, which is why big baits often lose their effectiveness once fish are wary of them. Then, small particle baits, which are much closer in size to a fish’s everyday food are more effective. As a general guideline – if you are fishing a clear lake you will usually do better to fish at night when fish are less wary, while in coloured water fish will move and feed during daylight. Even very large waters will, after several hours spent just watching and learning, seem far more satisfying when you have several good reasons for choosing a certain swim, and not just any spot because it looks attractive or the bankside shrubbery has been cleared away. 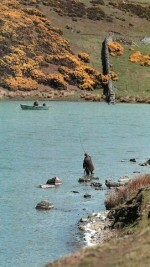 If you settle in a swim where the fish have stopped feeding, think about the situation. Has the shoal moved on to a deeper area as the sun penetrated the water? Or is it simply that the shoal has had enough and retreated beneath a nearby lily patch. There are always questions to ask when bites are not forthcoming, and the answer often lies in what happens along the marginal weed growths and beneath the surface.